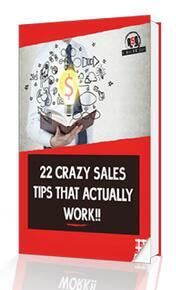 EBook - 22 Crazy Sales Tips That Actually Work! This eBook Is Packed With Sales Tips You DON'T Already Know! In an effort to help you get a competitive edge, we interviewed 22 of the world's best sales thought leaders and asked them what their craziest sales tips & sales hacks were, why they did them and why they worked. We we’re blown away by the uniqueness of many of the ideas! If you’re looking for a competitive edge, look no further! Download the eBook now!